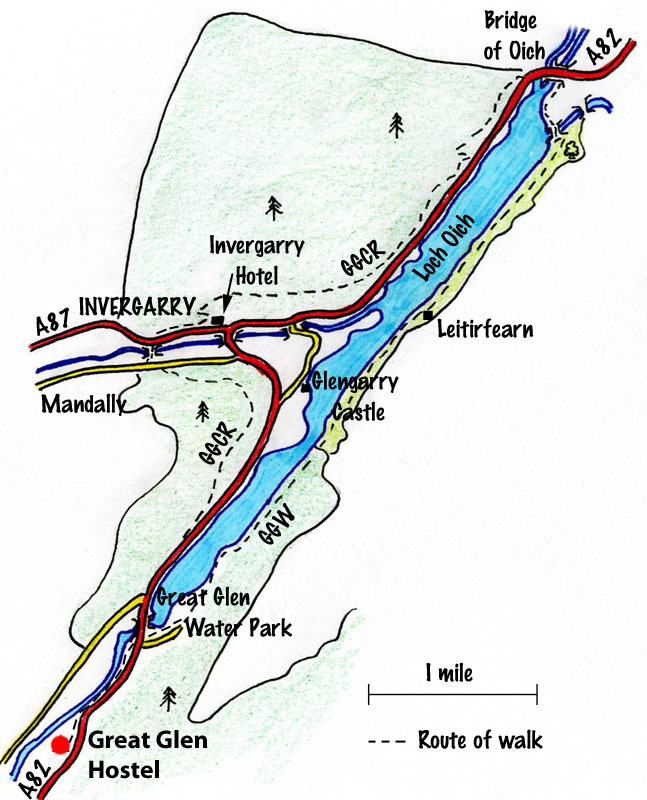 This is an enjoyable circuit around Loch Oich using sections of the Great Glen Way. 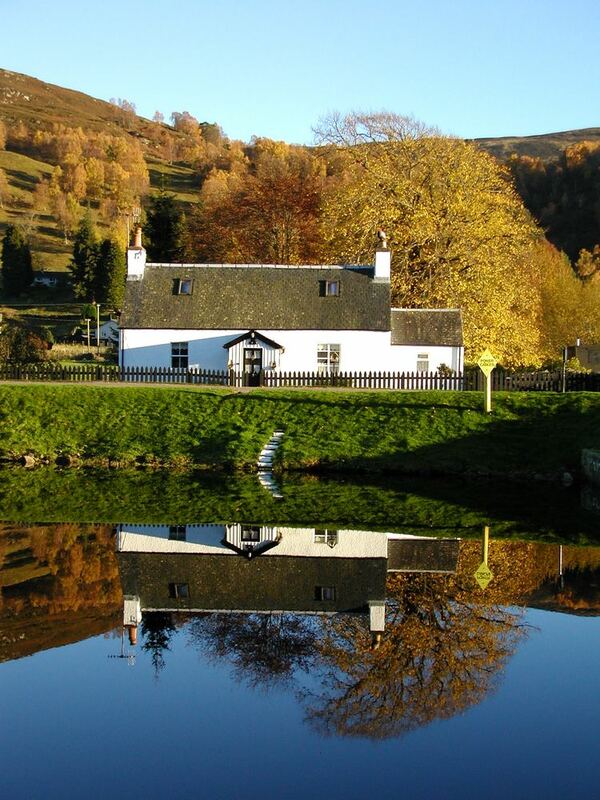 Turn left out of the hostel and walk 200m with care along the A82 to the bend in the road. Turn left here on to a track and then right over the wooden footbridge. This path is part of the Great Glen Way (GGW) – look out for the waymarked posts further on. After half a mile the path comes out on the A82; cross over and follow the GGW signs around the Great Glen Water Park. 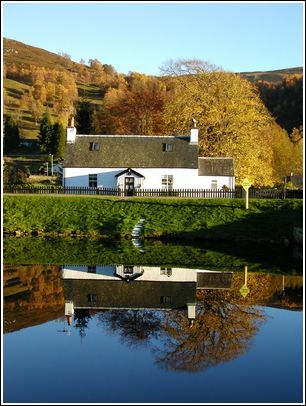 Behind the Water Park, the Way ascends to the route of the old Spean Bridge - Fort Augustus railway and passes the old Laggan station – the platform can be seen on the right. The Way continues along the old railway line for some time before contouring down to the left to the banks of Loch Oich. At the head of Loch Oich the GGW zig-zags up off to the left and on to a restored railway bridge. Cross this and continue to follow the GGW around the northeast bank of Loch Oich (where there are lovely views down the loch to Ben Tee and the Munros) and along the Caledonian Canal to Bridge of Oich. Cross over the swing bridge (parting company with the GGW) and pause for a look at the old Bridge of Oich before continuing west along the A82. After passing a phonebox and a small carpark look out for a narrow path – the old Great Glen Cycle Route (GGCR), maymarked as an alternative GGW route - ascending steeply to the right. Follow the route through the forest for the next 3.5 miles. Some sections are steep – watch out for cyclists! Towards the end a clearing offers fine views of Loch Oich. At Invergarry the track emerges on to the A87 beside the Invergarry Hotel providing a welcome opportunity for some refreshment. From here turn right (west) along the the A87 as far as the Post Office (about half a mile). Just beyond the Post Office a little path descends to an attractive bridge over the River Oich. Cross this, and beyond the gate on the other side turn right above the river until a second gate is reached. After this gate turn left and follow the fence south beside the field. On the other side follow a path up through trees to a gate and on to a single track road. Turn left here, and after the cattle grid regain the GGW alt. route at a forest track branching off to the right. 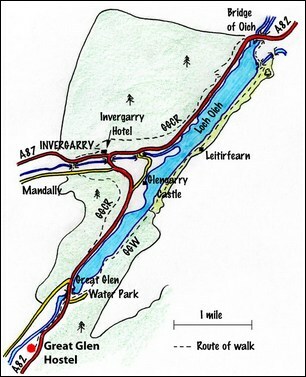 This track climbs steadily to a viewpoint of Loch Oich and Loch Ness and then descends back to the A82 at a point just north of the South Laggan swing bridge. Take care walking on this exposed section of road (there is no pavement). Cross the swing bridge and shortly afterwards turn right back on to the GGW and head south along it, reversing the first short section of the day’s walk back to the hostel. Terrain: Good paths and tracks on mostly level ground in the first section; the return has some steep climbs on gravelly tracks.